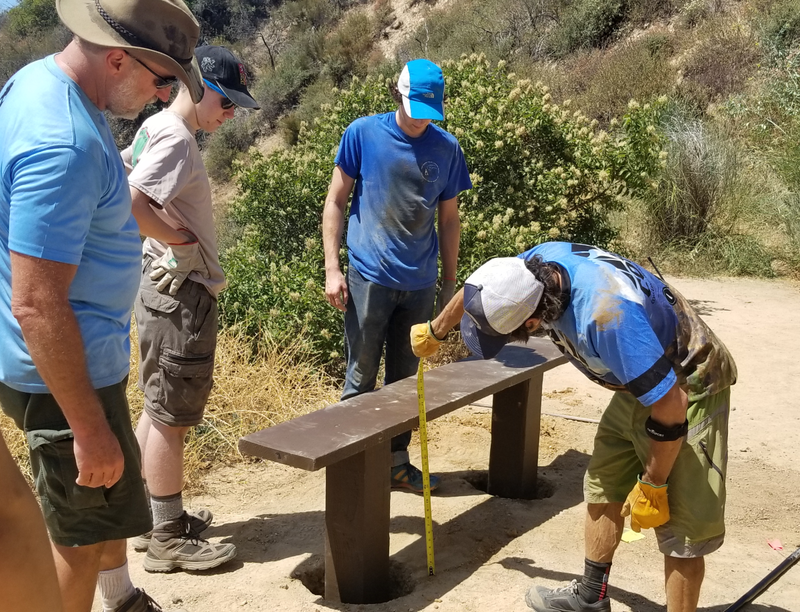 Today, Saturday July 21, 2018, Eagle Scout candidate Nick Sercel from Troop 502 in La Canada installed three bench seats at the highly-popular Brown Mountain Saddle. Brown Mountain Saddle (it’s local name) is the high point of the Brown/Prieto loop, or a stopover on the Brown/Ken Burton loop, and is extremely popular stop. In 2015, CORBA volunteers removed a downed tree from the Upper Brown Mountain fire road, not far above the saddle. The 20+ inch diameter tree was cut into 18 inch tall rounds, which we rolled down to the saddle. For the last three years those log rounds have been put to good use as a comfortable place to stop, take the weight off and enjoy the view. Now those log rounds are rotting, yet as recently as last month, people will find a piece that rotten wood to prop up and sit on. To us, this demonstrated the demand for seating at the saddle, and how popular it would be. Informal polls confirmed the public support. 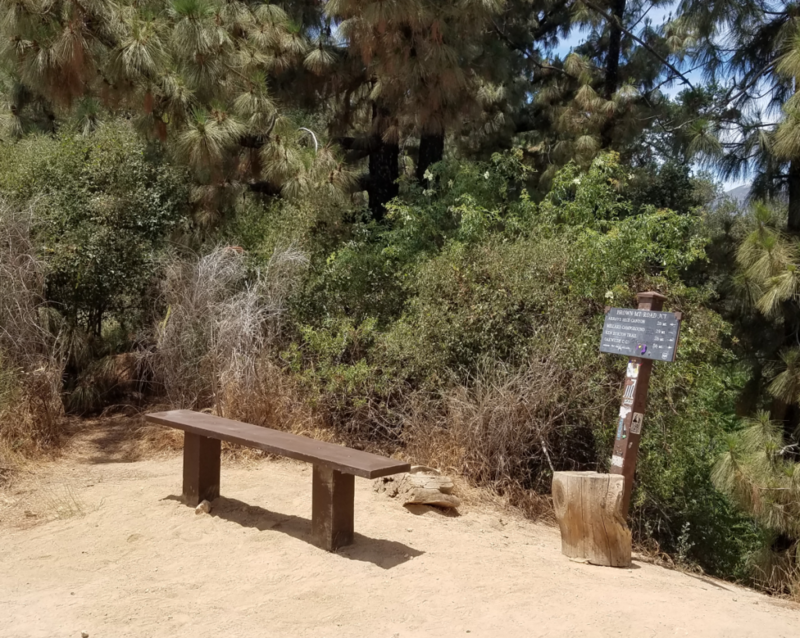 CORBA submitted a proposal to the Forest Service for simple bench seating, which was approved a few weeks ago after a review by Forest Service staff. 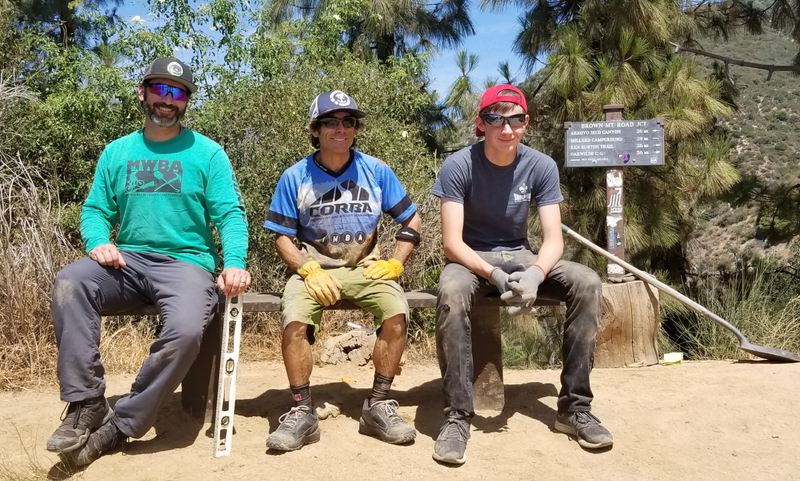 With the green light from the Forest Service, Nick Sercel contacted CORBA President Steve Messer to offer his services to construct and install the bench seats on CORBA’s behalf. trail. Chris reciprocated today helping haul wood, and dig holes. 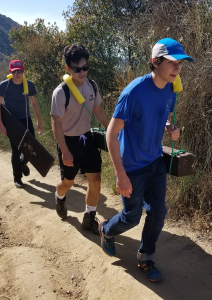 CORBA was happy and honored to help facilitate both their Eagle Scout projects (though a little saddened that Doc Larsen trail burned again last year in the Creek Fire and is closed once again). Nick spent a few weeks of prep work, planning, scouting the site and comparing similar bench seating in other Forest Service locations. Last weekend, he held a volunteer work day at his family home, cutting, drilling, and assembling the bench seats. With Forest Sevice-supplied paint, the benches were pre-painted before being installed today. Sixteen volunteers, Nick’s friends, family and fellow scouts, and CORBA/MWBA volunteers Erik Hillard (MWBA), and Mike and Robin McGuire got the job done today, Saturday, July 21, 2018. We met at Millard, had a safety briefing, then consolidated into a few vehicles and drove up the fire road from Millard as far we could. From there, the scouts hiked in carrying the pre-painted, drilled and cut, pressure-treated lumber for the bench seats, while Steve Messer and Erik hauled all the tools on Bob Trailers (made possible by the Robert Axle Project’s custom bob-trailer compatible through axles). Special recognition is deserved by Nick’s parents, who hauled up a cooler with lunch for everyone! After an hour trek/ride to the site, we began digging. Three benches required six holes about 3′ deep through hardened, packed dirt. Minutes after we finished the first bench seat, a crew of locals who have ridden here for more than three decades immediately put the first seat to the test as they rested before their return descent. They were surprised and very appreciative! We expect these benches to see a lot of use. Two are placed to enjoy the view, while the third is placed by the trail sign where it sees afternoon shade. All three benches were installed by 1 pm, well ahead of our scheduled finish. A hearty lunch was served, in time for everyone to enjoy lunch while seated on the new benches! The crew enjoys lunch on the benches they installed! It was a highly successful day! Despite the 90 degree weather, we completed the project. 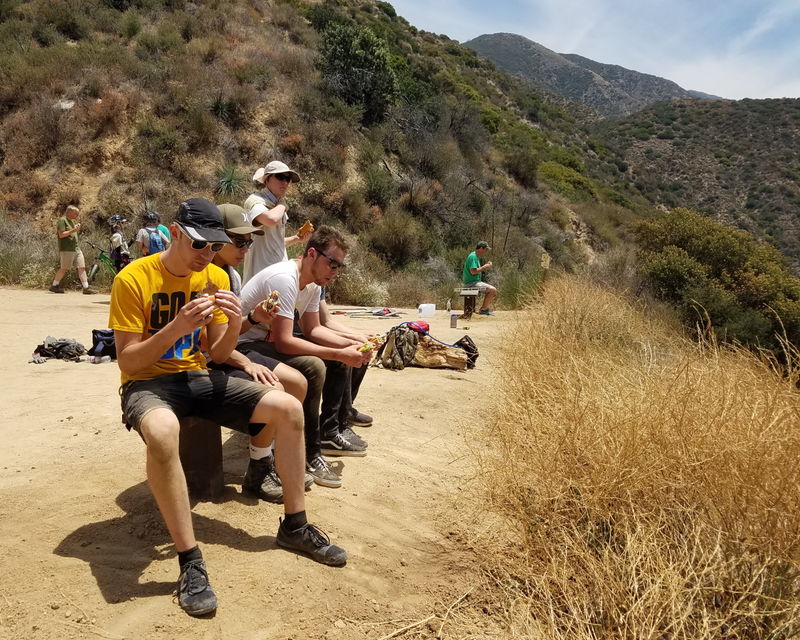 We thank Nick’s friends and family, Troop 502 from La Canada for their efforts to make these much-needed seating a reality. And of course a special thanks and kudos go to Nick Sercel for orchestrating the project. 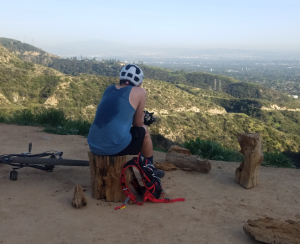 Dozens of mountain bikers came through the saddle as we were working, and everyone was excited and appreciative of this simple improvement to a popular stopping point for hikers, bikers and equestrians. Next time you do the Brown/Prieto loop (one of the most popular and accessible MTB rides in the Angeles National Forest), take a break, enjoy the view and the breeze, and give thanks to Nick Sercel, the Boy Scouts, CORBA and MWBA for continuing to support trails and mountain biking! The third bench, shaded in the afternoons, or out of the wind. 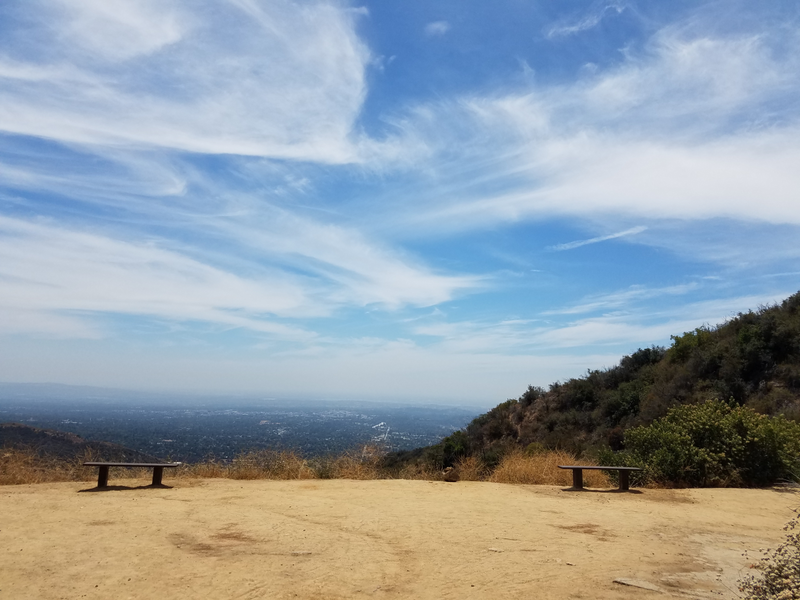 This entry was posted on Saturday, July 21st, 2018 at 7:16 pm and is filed under Angeles National Forest, San Gabriel Mountains, Trail Building and Restoration, Trail Crew, Youth. You can follow any responses to this entry through the RSS 2.0 feed. You can leave a response, or trackback from your own site.